Are you one of those investors who can’t let go of the stock market? It’s understandable, in a way. On a superficial level, the stock market continues to make a compelling case for itself. It seems resilient because it continues to fight back after each round of battering volatility. If you only look at that, you even might conclude prolonged down markets are a thing of the past and some new paradigm is in play where the stock market will just go up forever. Boston-based Grantham, Mayo, & van Otterloo (GMO), an asset management firm currently overseeing roughly $70 billion, also suggests you shouldn’t bet on it. As a matter of fact, according to GMO’s Martin Tarlie, the specific nature of the volatility that characterized the last three months of 2018 for equities is similar to that which precipitated not only the burst of the dot-com bubble in the early 2000s but also the 1929 stock market crash. “The volatility is consistent with a bubble bursting,” Tarlie recently noted. 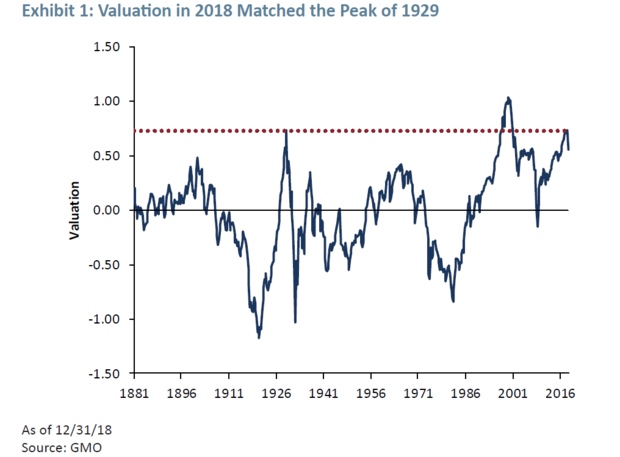 The red dotted line in the GMO chart below shows that the market valuation peak of 2018 reached the same level as the valuation peak right before 1929’s market fall. As for the recently reinvigorated stock market, GMO is not impressed and certainly doesn’t see it as a sign stocks will maintain an upward path. It’s important to note that Tarlie, in his analysis, is focused on long-term average valuation of equities rather than specific short-term moves. This is why, although he sees a bubble beginning to burst, he admits it’s “possible … the fourth-quarter move in the mean reversion speed could be a head fake.” He’s basically saying the sharp drops that characterized the stock market in Q4 2018 could be a short-term exhibition of extreme volatility that doesn’t necessarily signal the bursting of the bubble in absolute terms just yet and the market may move higher for a time. That kind of bubble behavior is not unprecedented in periods leading up to eventual bursts. The 1990 to 2000 bull market eventually became a bubble led by the rapid rise of the dot-coms. 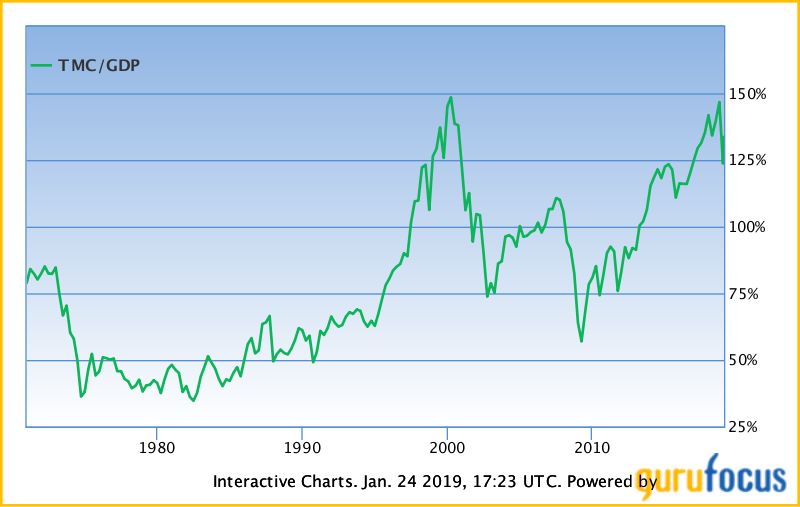 In the third and fourth quarters of 1998, it appeared the bubble was finally bursting, but then the markets – particularly the NASDAQ Composite – churned higher still for another year and a half before things came crashing down. It is difficult to dispute the significant valuation the stock market has been sitting at for some time in this decade. One popular metric for reading valuation is the ratio of total market capitalization to gross domestic product. This measurement is known as the Buffett Indicator, given the Oracle of Omaha’s well-known affinity for relying on the metric to determine when the market is pricey. According to the Buffett Indicator, the market remains greatly overvalued. The current figure of 133.7% is substantially above the range of what website GuruFocus says represents fair value: 75% to 90%. For perspective, when the dot-com bubble finally burst in March 2000, the ratio had reached 148%. In the subsequent 2 ½ years, the bubble continued to deflate to a more “normalized” valuation and the ratio fell to about 74%. It’s understandable for investors to want the stock market’s good times to continue. But the more prudent among them will check their emotions at the door and actually read the writing painted on the wall in big, bold letters. Not only does the stock market remain tremendously overvalued, but the recent forays deep into correction territory by all major indices could well be, as GMO’s Martin Tarlie suggests, a “head fake” that forewarns of an eventual – and much more painful – tumble from an even higher elevation. There’s no reason for your portfolio to shoulder this massive market risk. Physical precious metals are well-known to be effective hedges against the fallout from high-flying markets that eventually come to an end. If you don’t have any physical gold and silver among your assets right now, or don’t think you have enough, call Augusta Precious Metals at 855-242-4121 and speak to one of our knowledgeable gold and silver professionals. If you already have an IRA, 401(k) or other tax-advantaged retirement account, ask the Augusta representative you speak with about adding a silver or gold IRA to your overall portfolio. It is possible to buy physical precious metals inside of an IRA. If you’re interested in learning more, please don’t hesitate to ask about it.